Whew! The last three events were tough! Yesterday, I thought there were only two events and they would be quick. The idea of adding a pocket seemed like a simple thing. Well, not exactly. First there was the trepidation I felt when I had to actually cut the yarn; particularly since I was adding the pocket in a lovely section where I had got the purling, knitting and tension just right. Then as I pulled out the yarn on each side of the cut there was that large gaping hole...an intentional one...but large. 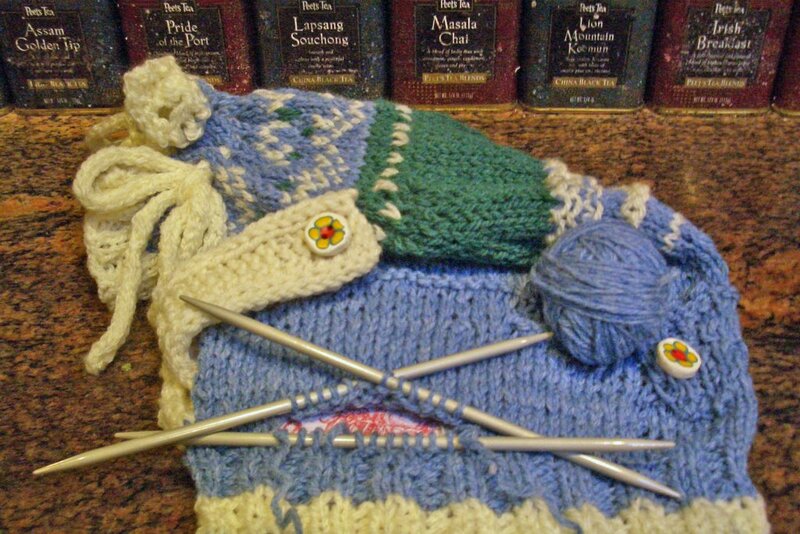 Then there was the entirely new event of knitting with three double pointed needles. They were metal which was fortunate - - when the stitches were real tight they slid easily from one side to the other. It was not so fortunate when my stitches became looser - - the needles would simply slide out of the stitches onto the floor. Obviously there is a method to using these needles...unfortunately it was not described in the book. At one point, I was ready to simply quit but then realized I would have a huge gaping hole so I preservered. The next event turned out to be something called Grafting. It is some sort of sewing which is supposed to look like knitting and used to close the bottom of the pocket. I'm not sure I ever got the hang of that but my pocket is now closed at the bottom so actual items can be stored there. Why I would store anything in a sampler is beyond me! The last event and one that seemed to last forever was to hide all the ends....boy were there a lot of them. I also used my new darning skills to fill a couple of those unintentional holes. I left a few for the memories! Now all I have to do is to figure out how to memorialize my Olympic accomplishments. How should I photo a 'learn to knit' sampler which increases and decreases and has all sorts of different techniques through out. It needs to make me smile when I think back at the the trials, tribulations and 'ah hah' moments as I worked through the many events. It definately needs to be memorable. Nicki, fantastic! You taught yourself to knit. 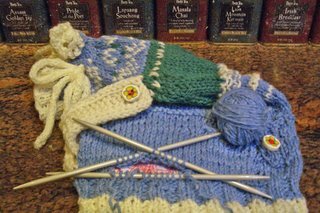 You WILL use most of those techniques again -- the knitted cord, grafting, and of course the more basic ones.